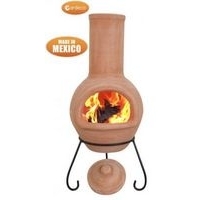 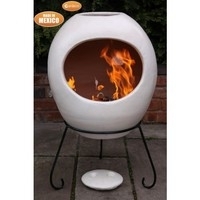 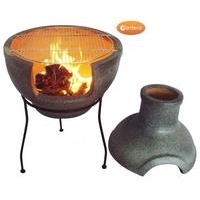 Chimenea is the Spanish word for chimney, Mexico is the origin of this beautiful garden ornament and patio heater, having become a popular feature in many gardens. 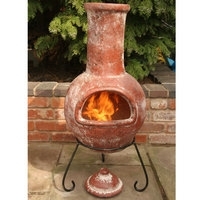 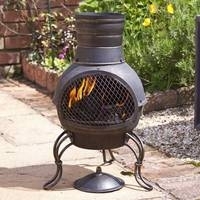 Clay Chimeneas are moulded by hand in a range of fantastic designs, colours and Mayan motives, clay absorbs heat like a radiator which radiates heat out to the surrounding area they also stay warmer longer than steel products.Clay Chimineas burn wood best however charcoal may also be used. 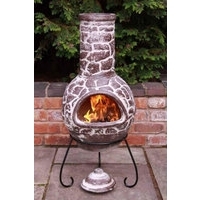 Before lighting place approx. 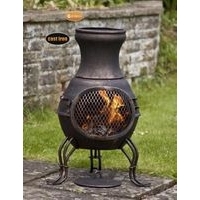 2"(50mm) of sand or lava stones in the bottom of the chimenea to protect the bowl from direct heat this will help prevent burning or cracking. 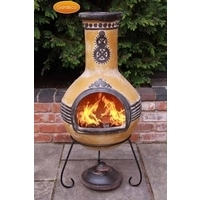 Cast Iron & Steel chimeneas will burn wood, charcoal and coal, cast iron absorbs the heat from the fire radiating it out to the surrounding area, remember if the chimenea becomes very hot then the paint will burn off and the metal surface will rust.